I spent several years in Hawaii as a kid. My dad was in the Navy, and we were lucky enough to have two consecutive posts, the first at Barbers Point, and the second on Ford Island. It was the Navy, though. A concentrated enclave of haoles, many of whom had no interest in going native. You didn't even have to go off base for most of your needs, so you could really avoid the local culture. But who would want to do that? My parents, fortunately, loved exploring the real Hawaii. Somewhat. They were concerned that my brother and I might become corrupted by native practices. My mom was scared to death I would begin speaking pidgin. (I did, but just not around her.) I will say that she allowed me to order poi in a restaurant one time. I didn't like it, but I tried! And we enjoyed pondoose (Hawaiian sweet bread) and malasadas (doughnut holes, essentially) from King's Bakery, all the time. My school cafeteria served pretty much a plate lunch every day. A scoop of macaroni salad, a bunch of rice (I don't think they were squandering two scoops on little kids) and some meaty thing. Vegetables? Ho ho. Go home and pick a papaya from your tree, that'll do ya. But my whole time in Paradise, I never ate a loco moco. They had them at Kau Kau Korner, but my parents thought that place was a hangout for disreputable teenagers (yeah, because it was a drive-in), so we never went there. I forgot about loco moco for decades. Then somebody I know posted a to-die-for picture of her loco moco plate lunch (she added macaroni salad, yo). Interestingly, it was Cranky who wanted this meal. Begged for it. Went and bought a pound of very good ground beef. Now, I'm the gravy maker in this house, but Cranky assembled all the rest by himself: rice, hamburger patties, and fried eggs. Brown gravy, OK? Jeebus lord, it was soooo guuuud! 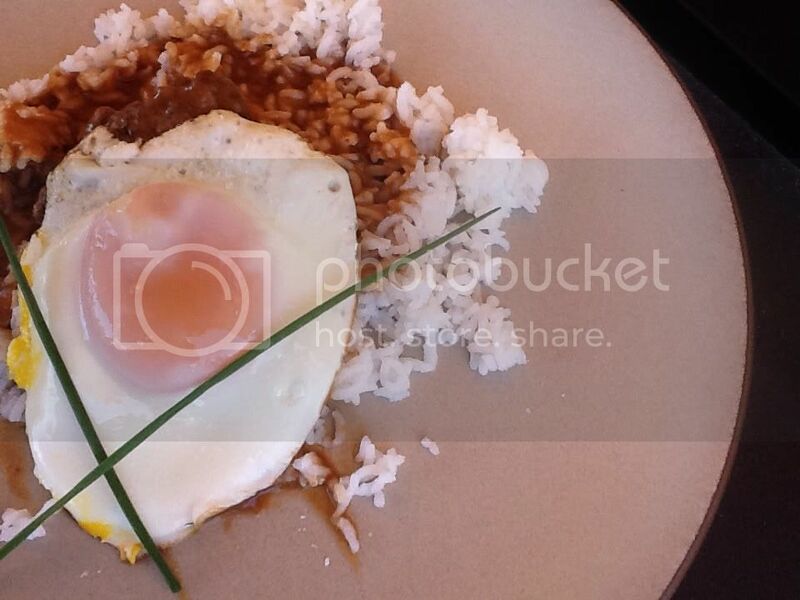 The patty on the rice, covered by a splodge of gravy, and the egg on top. The egg yolk mingles with the gravy in a very irreligious fashion. The gravy smothers the meat and the rice. Gravy on rice? Forevermore. We loved it. I am now a loco mocovore. A little late, but I know what I'm having for supper. I have never tried that despite many trips to visit family in Hawaii. Now, I will have to. Thanks for the tip! Oh, and your Mom was not alone in her worries about local culture. I once sat next to two nurses on their way to Hawaii for their first visit. They asked me if Hawaiians spoke English. Honest. Zoomie: I know you will get back to Hawaii, sooner if not later. But this dish is really easy to make at home. You can use store-bought gravy. Mr. Beloved would adore it. I am just realizing how contemporary a recipe this is. I didn't use ANY of those additions in my patties. Sounds so good. The meat was from Belcampo, though, and it was stellar, all by itself.